Jean Sebastien Giguere was admittedly surprised by how small his new pads looked after the NHL reduced the height allowance. (InGoal Photo by David Hutchison). 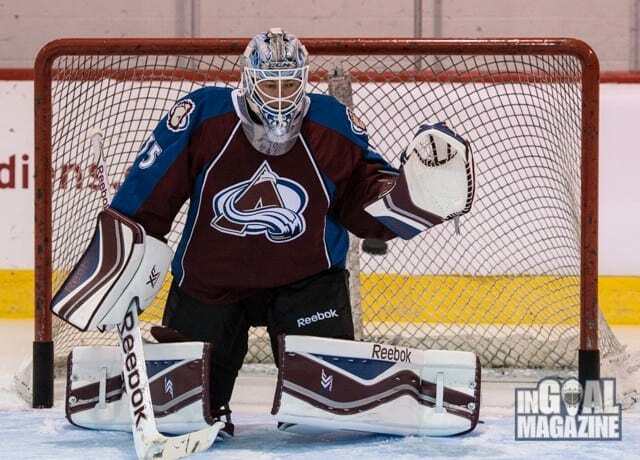 Jean-Sebastien Giguere knows there will be some who doubt it, but the Colorado Avalanche backup voted in favor of reducing the height of NHL goalie pads. Still, Giguere was admittedly surprised by how small his new pads looked when he saw and wore them for the first time at the Reebok CCM Goalie Summit in Montreal this week. Delivered straight from the NHL offices in Toronto, where the League’s top goalie cop Kay Whitmore signs off on each piece (literally, his initials are on on every item), Giguere’s new pads were two inches shorter than the ones he wore in Colorado last season. It’s all part of a 10 per cent reduction in the knee-to-hip allowance of the NHL’s goalie sizing chart, which was approved by the NHL Players’ Association and first reported by InGoal in mid-July but is not yet official – in part because they are still haggling over other reductions. If you ask Giguere, this is enough. The reduced allowance from 55 to 45 per cent of each goalie’s knee-to-hip measurement should create a two-inch reduction in the overall height of the average pad, though not everyone has been affected as much. At the Reebok CCM Goalie Summit, Corey Crawford, Marc Andre Fleury and Jonathan Bernier all had roughly two inches chopped off the top of their pads, but Roberto Luongo later told InGoal he will only lose half an inch. 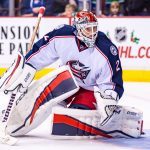 One NHL-contracted goalie told InGoal that he will lose three inches off the top of each pad, while others, including Henrik Lundqvist and Craig Anderson, have shown off what appear to be less drastic decreases in the height of their new pads on their various social media accounts. 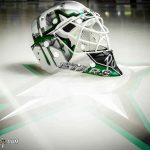 The changes will affect each goalie differently, not only based on how they wear their leg pads and what size kneepads they wear behind them, but also because of the style they play. 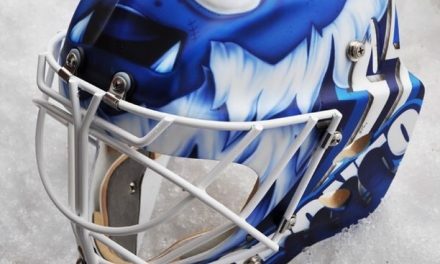 There was a lot of adjusting at the Goalie Summit, which included the debut of Reebok’s new Premier XLT line on Crawford, Giguere and Fleury, as well as a first look at the new-look CCM Retro Flex Pro Bernier will wear in Toronto. The four goalies on hand took turns checking out each others’ butterfly and tinkering with their own, trying to figure out how to close down a 5-hole the NHL reductions are designed to open up. Marc Andre Fleury checks his 5-hole with Marco Marciano and Reebok CCM pro rep Mike Mole at the Goalie Summit (InGoal Photo by David Hutchison). Fleury has switched to a straighter, firmer pad to try and make up for the move from just under 37 inches down to just over 34.5 inches, and was talking about beefing up his knee pads. He even threw out Lundqvist’s name while playing with his strapping, a reference to the Rangers goalie’s custom bootstrap that allows more of the pad to sit higher on the leg and slide into the 5-hole when he drops, something goalies like Anaheim’s Viktor Fasth have since copied. It’s a trend the NHL tried unsuccessfully to curtail by making the thigh rise a separate and specific measurement. For now it remains just one part of the formula for overall pad height. Most expect the NHL to continue pursuing thigh-rise specific limits next summer. In the meantime, Bernier is hoping a new vertical stitching on his retro CCM pads will at least help visually negate the move from a 36.5 inches to a 34.5-inch pad. Crawford said he won’t really know how the change affects his play until he gets into a game. There are many goalies and coaches that believe goaltenders will actually get faster in shorter pads, something that happened when the width was reduced from 12- to 11-inches after the NHL lockout in 2005. “It’s a little bit smaller, but at the same time it might help us for speed and quickness,” Crawford said. 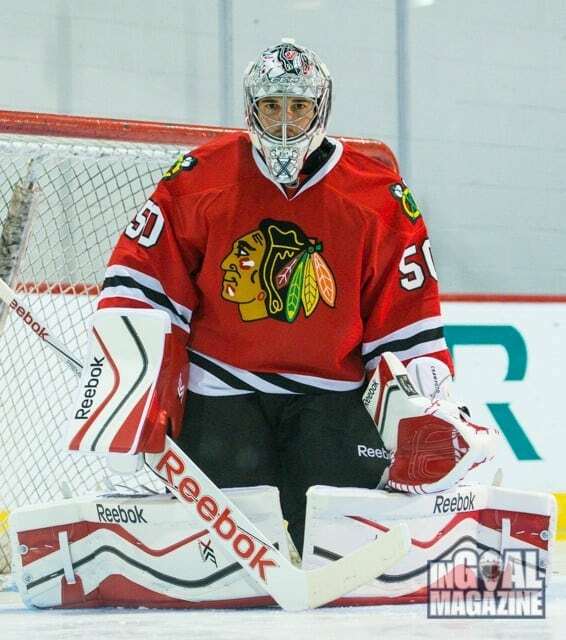 Crawford thinks goalies will adjust quickly to smaller pads – and maybe get faster as a result. (InGoal photo by David Hutchison). At least Crawford was allowed to keep his pads straight, something the NHL tried to also make illegal by forcing a mandatory curve or break into the rule book – a change the Players’ Association did not agree to. 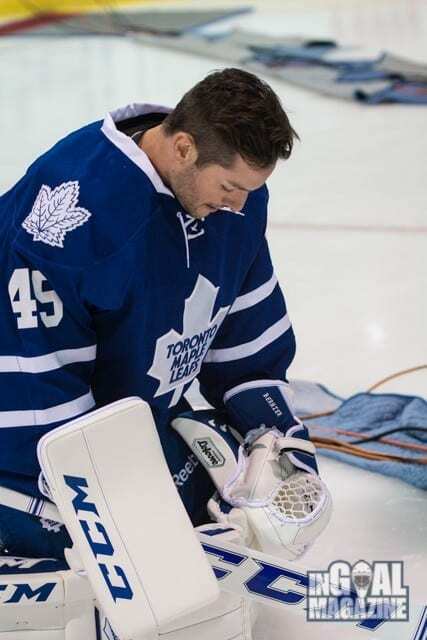 Still, even losing two inches will affect the intent of Crawford’s rail straight pads, which he likes to form a triangle in front of him in the butterfly to collect any loose pucks that bounce off his torso. The new pads no longer meet at the top to completely close off that triangle. “I don’t think it will be as effective as it was before but it’s just something I have to play with and see what works and what doesn’t,” Crawford said. 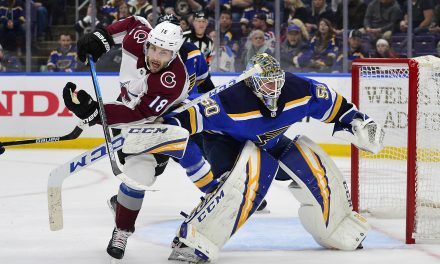 Ironically, Giguere, who has long been a whipping boy for oversized equipment, may be the least affected despite one of the most dramatic-looking reductions. His new pad height maximum is 34.5 inches, down from 36.5 inches last season. But because Giguere wears a pad based on a 35-inch knee placement, he actually went from a 35 plus-1 pad, with the extra inch up on the thigh rise, to a 35 minus-1, with half an inch removed from the standard thigh rise. 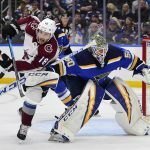 In an era where many goalies order plus-2 or more on their thigh rises at retail – and a few in the NHL were at plus-3 on the thigh rise last season – that will look like a small pad. 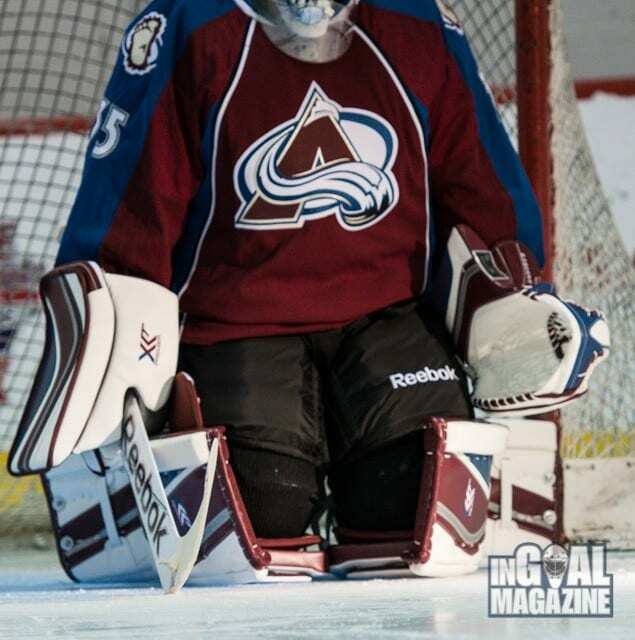 But anyone who has watched Giguere play knows he doesn’t use his leg pads to close his 5-hole. While other goalies try to flare out their skates in a wide butterfly that pushes the top of their pads together in front of their 5-hole, Giguere employs a narrower butterfly, with his skates dropping behind him, instead exposing and closing his knees in order to seal up his 5-hole. The NHL is still hoping to shrink the width and increase the contouring on the existing kneepad rules at a meeting in late August, which doesn’t leave a lot of time for the League’s goaltenders to adjust. As it stands now, many might be looking at larger options like the models Giguere and Crawford – and at least 20 goalies elsewhere in the NHL – are already wearing. 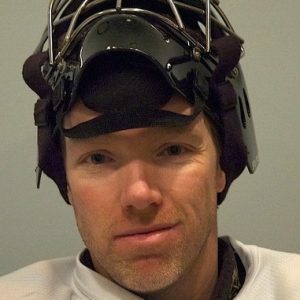 Fleury was already talking about adding them in Montreal, and Giguere believes goalies will need the extra protection as their knees are exposed by smaller pads. It’s an argument that will play out at meetings later this month, with some talk of maybe even giving goalies until the Olympic break to switch to smaller kneepads. 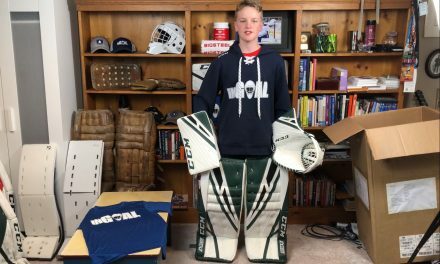 If not, it will be a hot topic again next summer, when the League is also expected to try again to make the thigh rise a separate, enforceable measurement, and eliminate the straight pads both Crawford and Giguere will wear this season. If you ask Giguere, there isn’t much room left to cut. 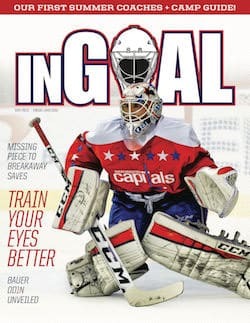 “There has got to be a limit on how much you can alter goalies equipment before they get hurt and I think we are close to that limit,” he said. The new Reebok XLT pads look great and I’m sure that shortening the pads anywhere from 1/2 an inch (Luongo) to 2″ taken off the top will take a little time to get used to. It means minor changes in the way the goalie played prior to this upcoming season but I trust each one of the NHL goalies to adapt fairly quickly to the new length. I also like the colour & design scheme on the trapper & blocker to go with their pads especially with Crawford & Giguere’s equipment. It will be interesting to hear each of the goalies remark on the change. I think this is going to threaten safety before it increases goal production. 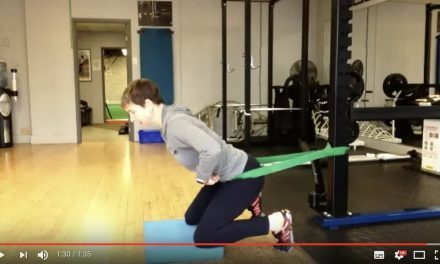 taking size off a standard thigh rise? exposing knees on purpose? I see hip and knee injuries becoming more frequent. 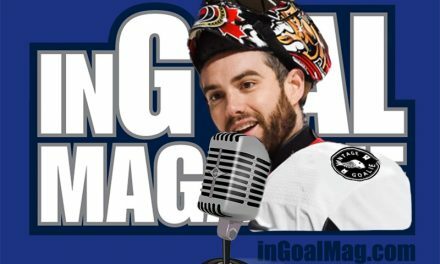 What top goalie is going to have his career threatened before Kay and co. realize goaltending is just on another level? Being a goalie, i completely agree with you! I know they do it to “increase scoring”, but goalies have gotten significantly better in the past decade or so, and the best hockey games are the 1-0, 2-1, and 3-2 games (basically the low scoring, one goal games). Snipe fests don’t make the game, its the two-way hockey that makes the game. If the knee is exposed, it’s the goalie’s own fault and it’s because he has a narrow butterfly. As long as the pad covers the knee (which it does) you can go into a butterfly without exposing your knee. The goaltenders who are unable to do this wear longer pads to go around it. 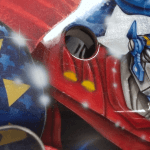 The main example of this is Giguerre… and besides, when I play myself, my knee is constantly exposed because my butterfly is very narrow, but I wear knee guards AND thigh guards and I never had a problem. 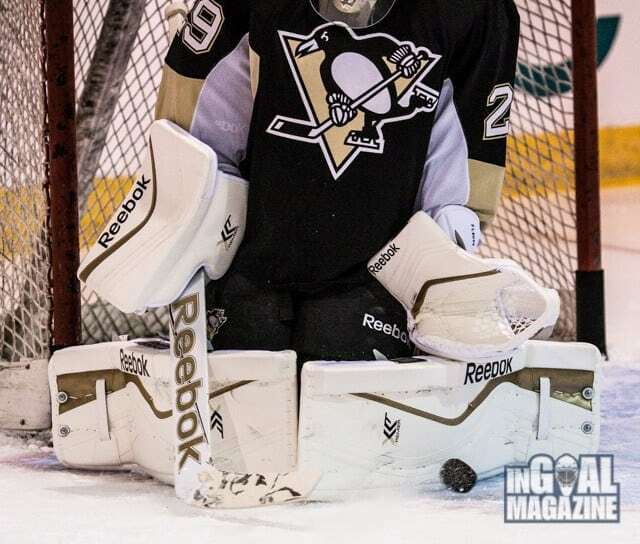 The longer pads were just a way to cheat… I’m glad they’re gone. I wear knee guards and have a good thigh rise and have been hit hard there before with a clapper. It’s not something you want to get used to. This shortening of thigh rises is going to be a short term thing. Leave it the way it is with leg pads and maybe clean up the chest protector being a bit too big as well as the jersey. To me this isn’t a particularly well thought out strategy to increase goal scoring. Changing the rules on the ice is a better way to do it. Shrink the neutral zone or change the offside rule and maybe even the placement of the faceoff circle. I am sure as a goalkeeper, you can respect the intent of the new rules however I believe it is another attempt to increase the attractiveness of the game by increasing scoring opportunities. Sure there were some good shooters in the past but they don’t hold a candle to the now 100 mph shots that can be generated with these sticks, unless we want to go back to wooden sticks as well. That is a great point Brian. People compare players of today with the ones of old and because the game has evolved and changed so much I’m sure the greats of old would have a run for their money against some of the elite D1 College athletes of today. With trainers constantly evolving their workouts, the increasing intensity and challenge of players competing at the levels now, not to mention the equipment i.e. composite sticks, and goalie pads. Ultimately, this is hockey. I understand making more money and attracting more interest but the NHL has to keep their current fans interested. With 2 NHL lockouts in a decade….constantly changing goalie standards….this isn’t basketball…. Hockey is a finesse game which uses “O” and “D” to be successful. I’m unsure that the avenue they have chosen to “spice” up the game is the correct choice. I agree with this, how often are goals through the 5 hole on highlight reels aside from breakaway dekes. It might improve the shootout and there may be an extra goal or two per game, but they wont be anything spectacular. The fans want to see goals off the post and crossbar, maybe reduce the gloves a bit more… But in my eyes these goals come from skilled players and shouldn’t be something any 4th liner can accomplish. Roy’s pads increased as time went on, and he, like every other competitor, looked for an advantage. 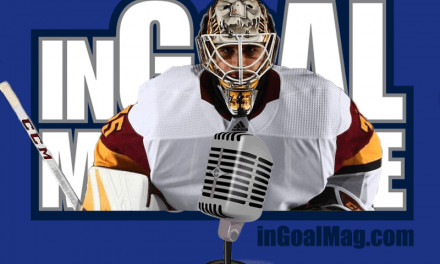 But you’re are correct, in that if you look back, his pads were considerably shorter, and he played a butterfly more like Giguere, where his knees closed the five whole. I’ve played for 30 years, and at 5′ 11″, i currently wear a 33″ pad with no additional height added on with a set of Bauer Reactor Knee protectors, and this closes my five whole fine, and i’ve yet to have any significant knee damage. that said I don’t take 105mph slap shots from Chara either (only 90mph at best). I tried a set of 34″ pads for a single season and it slowed me down, these 33″ pads made me ten times quicker. Speed in the NHL game can be a huge asset. When the NHL thinks they’re creating an advantage for players, they may not be. As straight on shots to the five hole will be handled, but that 2-1 that a guy had to haul accross his crease to stop that might have gone in last year, they might not score this year. These guys are the best in the world, and adapt to these changes fast. I agree, the equipment has gotten big for the sake of big in many instances. 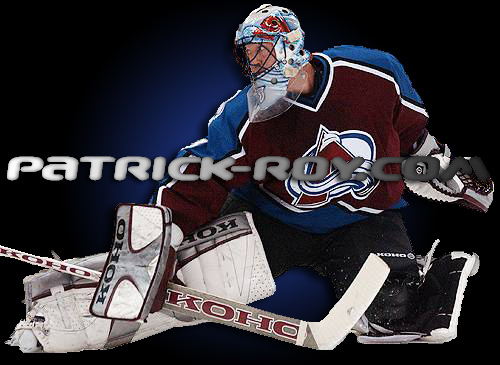 Roy’s pads always stayed 33″ tall. Koho/Lefebve and Reebok figures out how to make a 33″ pad taller. Look at one and a Vaughn in the same supposed measurement. The RBK/KOHO line is always bigger. Point exactly. I wear and have always worn a 34″ pad. They close just fine. No bad knees, no pucks off them and I’m 6’1″. The pads for the same goaltender in the NHL was 38″ for my height. The pads need to come back to Earth. And i’m not naive or stupid. The pads are made to cover net. The game is completely different now. You no longer have certain individuals that shoot hard… with the composite sticks and the bigger and more intense trained players make most everyone a hard shooter. 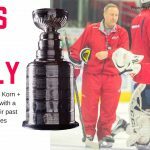 I have been playing hockey since 1978, and I have played at all levels… including pro… things are not the same as the 90’s or even the early 2000’s. The players today are bigger, faster, and more accurate with the technology in sticks. The equipment has kept up with the progress of the game. With rule changes and as mentioned early the ability and technology for the players has made everything on an even plain. 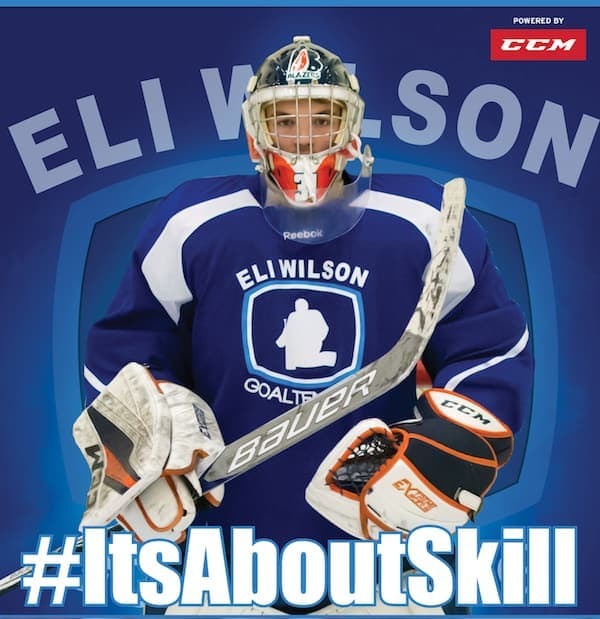 Its not the equipment that makes goalies better, or gives them an unfair advantage… it is the training and expertise that makes them good. The position has come down to a science. Growing up we didn’t have to stay in shape year round, and attend camps in the off season to refine your game. Now a days you either progress, or get left behind. It is year round work and fine tuning your craft. If it was simply a matter of equipment giving the unfair advantage to the goalie, then we would see more goalies rising from the ranks into the NHL… all you have to do is watch a game where a guy is called up to the pros, gets in the game, and for the most part, get lit up. I know, my first time getting the call, I got a fast lesson of how much harder I have to work, and that talent (for the most part) and over sized equipment isn’t going to keep the puck out of the back of the net. I am 6 foot 6, and even with the larger pad, I am still exposed in the knee area and have taken shots that have damaged my knee and thigh. If you think Roy’s pads never extended past 33″, I want whatever you’re drinking. 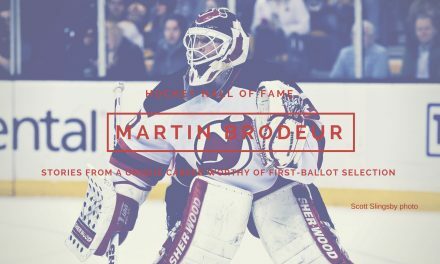 http://www.justincrawford.net/roy/newSplashRadial.jpg Let me guess, you think Brodeur still has tiny pads, too, despite coming up in size the last few years and continuing to play with a chest protector with pillows on the outside of the arms? As the league continues to focus on goaltending equipment, they fail to see that there is much more than that contributing to less goals. The systems and coaching that are in place now limit the time and space that a shooter has to pick his shot. 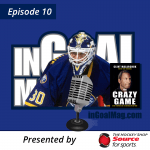 Both goalies and players are better at shutting down chances. Just look at the all-star game for proof. Less defense there equals all kinds of goals. And last time I checked, the goalies had the same equipment on and the nets were the same size. When players have time and space, they can still score. Maybe a larger ice surface would make more sense. Also, they dont understand that what really is exciting is not only the goals themselves, but rather the goal scoring opportunities. Therefore a bigger ice surface would make more sense to create more options for players. Just look at som of the plays you see in the KHL. Imagine that with the overall higher skill in the NHL. Al Iafrate had the hardest shot at 105.2 MPH back then. The biggest difference in the game is the speed. And why are goalies concerned with the knees being exposed? 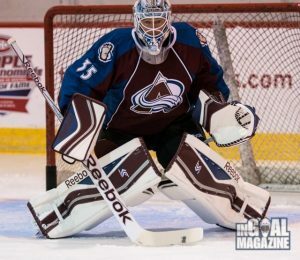 Because the new technology pads “roll” around the knee and it doesn’t allow the pads to cover that space (look at the Giguere picks), the old style pads you dropped into the knee roll and they didn’t rotate around the knee/calf area, in turn exposing the knees more. Goalies didn’t wear masks when Bobby Hull was firing Bombs with his “new” invention, the curved stick. The technology today has changed the game and always will with any sport. Its the pad design not the players sticks that are causing this knee concern. The catch though, is that there were only a handful of guys who could shoot over 90 mph back then. These days, even a plug, who used to shoot 45 mph tops, can get 60-80 mph out of a stick, and most pros, are getting 80-95 mph out of their sticks. Huge difference between then and now. What was once the exception, has become the rule. Believe me when I say that guys whose shots should be getting weaker with time, forced me out of my old school gear, and into modern stuff for more protection, because they got harder. I’m talking 50+ year old guys, whose wrists and shoulders, are surgically repaired a few times over, and a guy who is still recovering from having part of his arm cut out because of MRSA, and can still give me stingers because of the flex on his stick. None of these guys, would have near the power that they do if they were using wood. I can say that for a fact, because I’ve played with them for the better part of 15 years, and faced them when they were younger and using wood sticks. You can argue that there were guys with hard shots back then, but we both know that there weren’t nearly as many with hard shots then, as now. Don’t kid yourself, and don’t try to pull wool over people’s eyes. Basically, your argument comes off as saying that we should go back to using gear that leaves us prone to injury. No offense, but if you believe that, then go ahead and play with a Plante style mask and old school gear. See if that smaller 2-piece chest and arm protector keeps you safe from the rockets that even weaker beer leaguers are capable of. Why should players be allowed to advance technologically, and not keepers? Wool pulls two ways. You seem to equate smaller gear with older gear, and the truth is, they’re two different things. Today’s gear, even if made an inch or two smaller in spots, is light-years ahead of what goalies had even 20 years ago. A 1-inch reduction in thigh rise isn’t nearly the same as sticking a Jacques Plante face-shield on a guy. Honestly, the increases in pad sizes have never been about the safety of the goalie; it’s disingenuous to say this is all about injury risk. Keepers are worried far more about harder shots going past them than they are about getting hurt by them. The proof is simple – goalies could go back to a more stand-up style, and save their bodies a lot of wear-and-tear (the repetitive motion and unnatural bending causes far more hip and knee injuries than puck or stick impacts). They play more physically-demanding styles anyway, because it helps them tend net more effectively. And nobody on earth would ban the butterfly as a safety measure. The reduction in pad size is exactly that, and only that – the pads weren’t covering legs any more, they were covering open space, and they were never meant to do that. Yea, i want my multimillion dollar goalie wearing unsafe equipment? No, that’s not what I’m saying. What I’m saying is the pads have become oversized and are now covering more than just the body. They are covering space to maximize the size they can take up in the net. Time to bring them down to what they were made for. Protecting the goaltender, not taking up space. okay then with this logic, sticks should go back to being wooden. 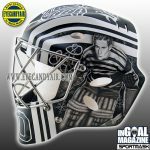 aka the bare essentials to scoring as would be what you’re trying to imply for goalies wearing the bare essentials. The ‘new technology’ pads you’re referring to are pads designed to butterfly. They HAVE to operate they way they do in order to optimize rotation for an effective butterfly save. This necessitates a certain amount of looseness around the knee in order to allow the pad to rotate about the leg. Many modern goalies also prefer stiff thigh rises to prevent issues with the pad interfering with the pant leg. 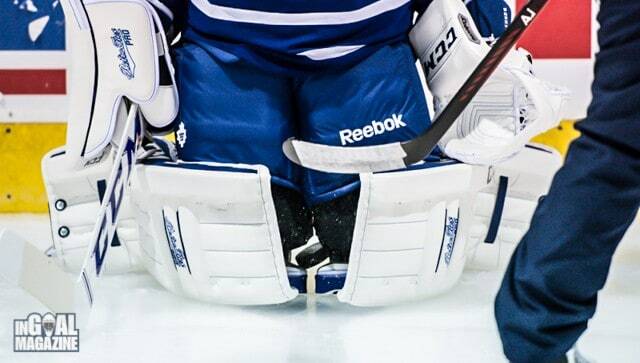 In order to get a pad to wrap around the top of the knee like ‘olden times’ you’d have to significantly compromise the pads rotation ability which is not something goalies are going to do as it would fundamentally change how they play and expose other areas of the leg to injury. The solution, as mentioned above, is adequate knee protection behind the pad. Your contention that the players sticks and the harder shots aren’t part of the problem is naive. Of course you can name a handful of players that could launch pucks with wooden sticks. That’s not hard. The fact that even fourth liners and AHLer’s can routinely get shots into the 80’s and 90’s significantly changes the sheer volume of high velocity pucks that are going to be heading at modern goalies. If increased velocity for nothing but the price of a stick wasn’t a stone-cold REALITY for EVERY PLAYER, then why don’t any NHLers use wood? Glen Hall invented the butterfly save with what? Leather cow hair stuffed pads? Esposito? Your point “HAVE to operate they way they do in order to optimize rotation for an effective butterfly save” is saying the pads are unsafe for goaltenders that play that style? Not the shooters? Weird. Lots of goalies made butterfly saves before the current surf board sized pads were born. Guys were making those types of saves with the old stuffed pads too without them rotating? The pad rotation helps keep the full flat surface towards the shooters so you maximize the with of the pad height when in the butterfly. It helps control rebounds too. 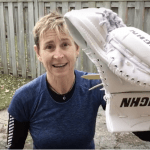 The question is – why do we WANT to help goalies stop pucks more effectively? I get it if Safety is your concern – but the whole point of changing equipment is to INCREASE GOAL SCORING. If it makes it harder to control rebounds? great! Harder for the pad to make contact with the ice surface? great! Sounds like the ideal sort of change. Phil Esposito also was the guy who would stuff his pads with stuffing from a couch. So he could press it down during measurement, then it would expand to a larger size. Also made his catcher bigger by adding the wrist blocker… thus making his catcher bigger. You keep referring to back in the day Bobby Hull, Brett Hull, and Al Iafrate these guys had bombs I agree. What you are missing about the new composite sticks is this doesn’t help slap shots, these weapons (cause that is what they are) drastically improve everyone’s snap shoots. These guys are walking in and snapping bee bee’s at 85mph. I take it by the way you talk you are 50+ years old and never played elite level hockey, plus you say you are 6’1″ and still wear a 34″ pad how 80’s of you. I am 6’0″ and I wear a 34″ with 4″ rise and I will never wear anything less to protect my knees. Have you ever got a shot directly on the knee even with those knee protectors? 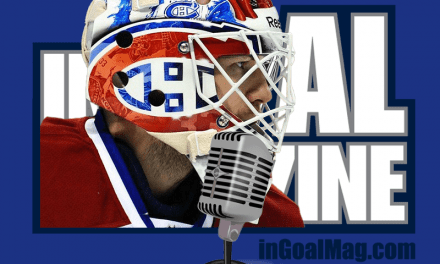 It absolutely kills… I do agree that some NHL goalies did abuse the rise, but they still need to feel protected in order to play well. NHL will always do anything to improve the shooter and always take away from the goalie….. Here are some good pica to what the league needs to get back too. 34″ pads, normal sized Chest and arm rigs. The funny thing is the GAA was down even in this area. I agree the systems and goalies have gotten better but the equipment has ballooned over the past 10 seasons. And in this photo, Potvin is wearing between 32″ to 34″ pad and you can see there is no knee exposed. 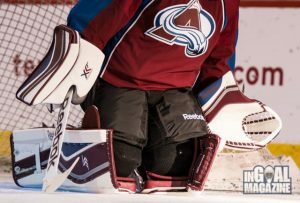 The pads have changed to allow goailes to slid on their more and to become “blockers” has Giguere is saying in the ariticle. are we losing focus that this is just a game! No one will play a game with a very very good possibility of getting hurt. so why is the league trying to injure goalies? 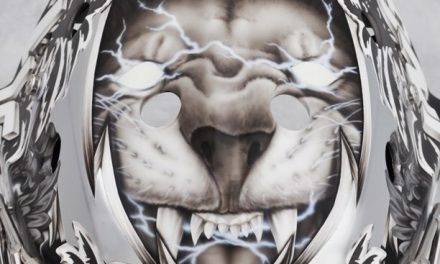 You don’t see the league inhibiting monster shoulder pads made of ballistic unobtanium, which cause so many concussions or huge elbow pads which can knock out a tooth at twenty paces.. or how about there wicked insane sticks that they get to use now, that are only allowing harder, faster more accurate shots.. The league does everything in its power to protect players but is doing everything to inhibit goalie protection.. Also why is any head shot to a player of hit when he is not expecting it a 5 and game with a possible suspension, yet ramming a goalie when he is concentrating on the puck or worse, in the middle of making a save and is very exposed hardly ever penalized or if it is only given 2 min… Time for Shanny to read this and start protecting the GOALIES. The rule should be ANY contact in a stationary position from the player involving the goalie during a scoring chance will result in an immediate 2 min. penalty.. ANY contact with a goalie involving motion during a scoring chance will result in a 5 min and game misconduct, supplemented by suspension action.. just a thought.. 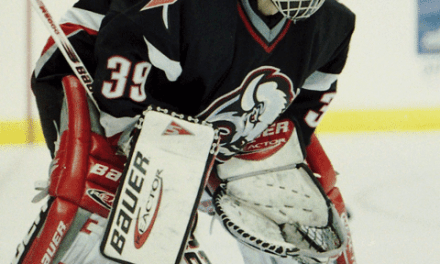 If limitations are to be imposed, then they should be addressed universally, in addition to goalie equipment sizes, how about player stick flex ratios and materials which give the shooter that extra “kick”; the contact rule should also be revised to include the goalie; standardized ice surface sizing and end board construction in all NHL rinks. Another alternative to monkeying with pad sizing, monkey a bit with the net size. Goalies will always adapt and overcome, its what we do a d the current crop of pros are no exception. What this will do for the fan is bring out the true athleticism needed for this position in the forthcoming season. The pad limitation will however serve as a boom in sales for the big brands who will inevitably reward the NHL with healthy sponsorship dollars, as the new limitations/restrictions will inevitably be adopted jn quick fashion by competitive leagues all the way down the line as each wannabe one day pro goalie seeks to master the new sizing. 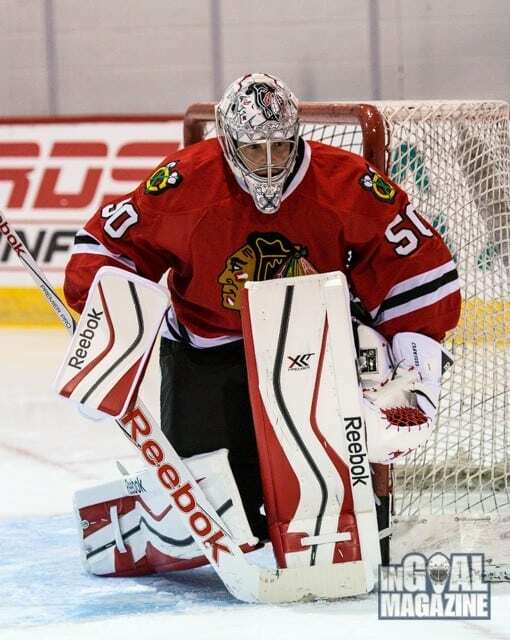 “One NHL-contracted goalie told InGoal that he will lose three inches off the top of each pad” – I wonder who that is? 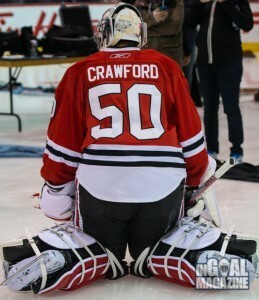 I would have guessed Crawford since he’s had ridiculously huge pads in the past. Gustavsson also comes to mind when I think thigh rises. I dunno man, Giggy’s pads look like he took em off some kid. Especially when you compare him to the other goalies in the pix. Looks like the guy who initiated the rule change got screwed as a reward! I hope he gets them remeasured cause his knees look way too exposed. DANGEROUS!! Good thing he’s got those Swiss made Kevlar kneepads that they also want to take away. At some point, they’re going to have to acknowledge that some of the bulk, is for the keepers’ safety. Excellent point about the knee pads…wait till a few star goalies are injured…then maybe the owners and GMs will say something. They’ll never expand the ice surface for the simple fact that rinks would lose too many seats ($) in the process. Should stop D-Men from falling to block shots. Like 40 blocked shots in a game nowadays. Thats ridiculous! Spot on with the stopping blocking, and ice size change. I also agree about shooting. You’d think that with all of that stick technology, that they’d be able to hit the net. Trouble with stopping shot blocking, is that it’s much easier to make goalie equipment a scapegoat. As seen in the Fleury and Crawford pics, keepers will adapt and overcome as always. This just means that they have to go back to being technically sound to close the 5-hole. As long as adequate knee protection is available to them, I see no issue here other than the fact that the longer legged keepers, are largely unaffected by this rule, and still have overlapping pads in many cases. I thought that the goal was to make equipment smaller across the board, not just for a minority of keepers. The rule, will do nothing to increase goal production significantly, and I think that when it fails to do it(not if), that both Kay Whitmore, and Gary Bettman, should be relieved of their jobs, for wasting time and resources on this. They’d do better to just make a rule prohibiting the overlapping of the pads in any way, and penalizing and/or fining keepers if they are found to be in violation of it. Make it simple and uniform across the board. Allow for touching, but not overlapping when the knees are together. Simple, effective, and fair across the board, and leaving no room for the exposed knee leading to injury debate. 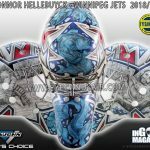 Also, I’m kinda bitter about the delays that this mess has caused for people like myself, who have paid good money for custom gear, and now have had an extra 2 months tacked onto our wait, while the manufacturers, are forced to rebuild pads that they had already prepared for NHL keepers. The last minute change, didn’t just inconvenience the NHL keepers. They could have dealt with it sooner than they did, and given the guys more time to prepare for the new rules, as well as manufacturers more time to build the gear to the new specs. 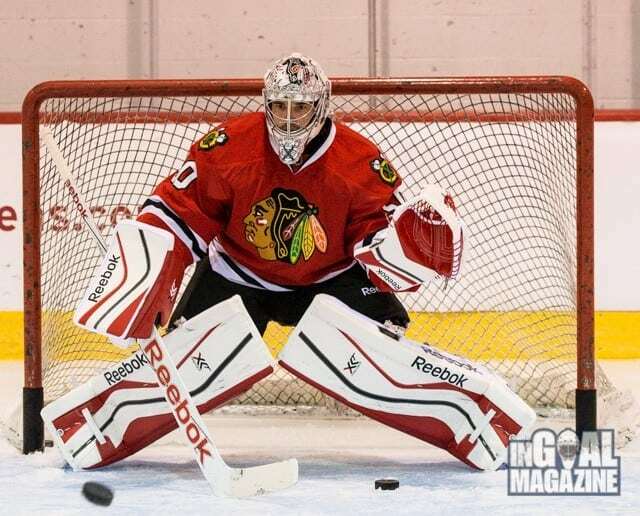 Why does anyone care (besides NHL goalies) care whether the pads have been reduced in size? Really, why does anyone care? Because they don’t want to see their favorite NHL goalie get hurt? I call B.S.! It’s pure aesthetics and that’s all! 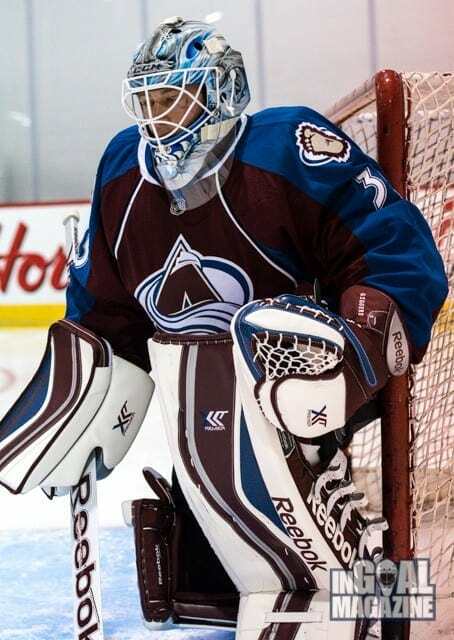 Tall goalie pads LOOK COOLER and that is why everyone who doesn’t play in the NHL are up in arms about. Again guys, it’s more about stopping the puck and not so much how you LOOK that makes a good goalie. A couple inches are not going to make a difference and if it does, then they don’t deserve to be in the NHL again. 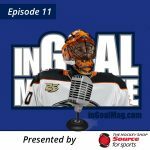 What you guys are completely missing is that when Giggy and all the other goalies talk about knee problems they are not just talking about direct shots, but rather the extra pressure and force that will be applied on the knees and hips as a result of the shortened pads. I am still a young guy but I am going into my 14th season of highly competitive hockey and I have terrible groin and hip issues already. Having the extra pad length lets me relax when I go into the butterfly and not have to tighten and pull my groins together in order to close the five hole. The added thigh rise I have on my gear has allowed me to go 4 months without a bad groin injury, something I would’ve considered impossible with the older, smaller gear. 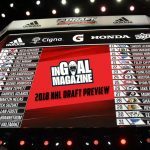 If the league really wants to see more goals in the NHL it would make much more sense to make the goal bigger rather then making goalie gear smaller. The NHL needs to worry more about the safety of their players rather than the money in their pocket. not only no, but hellllllllll no. there are many more ways to create more goals before that should even be considered. This goalie’s gear makes a hockey goalie look almost like a joke as far as equipment dimensions are concerned. Now, having seen the sport on tv I know that even with these monsters in the net the scores regularly go into double digits- not total score but double digits for both sides of the scoreboard. What does that prove? Perhaps that yet again the NHL brass is barking up the wrong tree. Many goalie here have identified the defensive systems, systematic shot blocking and the throwing away of the rulebook come playoff time as a major cause of fewer scoring chances. why do goalies understand this but seemingly not some of the NHL rulemakers? Rob Roth summed it up long ago. Take away the PLAYERS padding, not the goalies. For any given game I would estimate 25-30% of all shots are blocked away by players with body armor. You want more shots on net? Take away the player’s padding. They won’t block shots. Don’t take away padding on the goalies. Once thigh rises overlap, they’re not adding any extra blocking area, anyway. Taking odds. 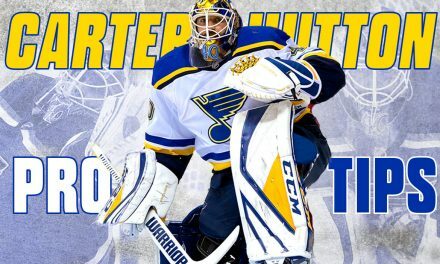 First goalie to lose a kneecap this season will be…. who? I wonder what Bauer, Koho and Vaughn have in store for smaller goalie pads….? Also does anyone know if TPS still makes pads? So we have reduced the equipment. So what will the league say later when this has little or no effect on goals scored. Meantime, maybe injuries rise for goalkeepers? IMHO, while the gear has grow, so has the speed and skill of the current generation of players. The sticks now generate lethally quick shots, and the accuracy of the current player is phenomenal – often several lines deep. It is not the gear. The fan wants to see scoring, yes. But I argue, the fans want to see a fast free flowing hard hitting game. The key is the opportunities to score. What they do not want is grinder games with 15 shots on goal per team. They will accept a lower scoring game if the saves and the speed and the shots are present. To me, all clutching, grabbing, grinding, trapping is what makes these games lower scoring, –If each team gets 35-40 shots, there will be goals, there will be saves, and there will be goals. The players are too good –if you let them be good. Do not take away hitting, just enforce rules that allows precision hockey to be played. Goalie gear is a much smaller worry than the flow of the game. From the pics. Narrow butterfly now endangers the knee cap way too much for my liking. What’s next are we going to use a blue puck like my 5 year old does? Larger pad will always mean slower response and recovery time. That alone in my opinion is equivalent to the surface area covered by larger pads and 5 hole coverage. For anyone who doesn’t believe this pick up a 35″ pad and then a 35+2 or 3. The weight increases by just under a pound. Doesn’t seem like much but in a game of fractions of seconds the difference does have an impact. This will cause an insurgence of bigger, fatter goalies that can actually fill those huge pads, and slowly phase out the athletic goaltending we currently see, watering down the game again resulting in loss of tv coverage again. They say everything is cyclical, and seeing as tv coverage is all NHL cares about, consider this the downward turn phase. Stay safe goalies! Folks like to talk about how the game has evolved and about how players will always look for the advantage. It is important to take any equipment advantage out of the picture. An “evolving” game is not necessarily a better game! “Un-evolved hockey was great and exciting 30 years ago. Let’s take the “smarts” out of trying to outwitt the opponent with equipment set solid standards. Look at how bulky the players look today. They are wearing so much equipment! Back in the day, you would never see so many players diving in front of pucks like they do taday. Many players on the Rangers last year wore special protective equipment so that they could dive at pucks and think later. It’s time to respect the puck! As a goaltender for over 40 years, I’ve been through all the generations of equipment. My opinion on the changes are it will make little to no difference in scoring. 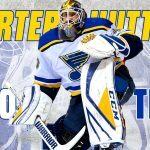 Most goalies are playing a blocking style and will figure a way to close the 5 hole (plus the smaller pads will just add a little extra quickness). Next step, reduce the size of the ridiculously large chest/arm protectors and the oversized jerseys that you may as well consider to be nets. I think this new rule reducing the pad size from knee to thigh is absurd. This rule is going to end up ruining goalies seasons/careers when they end up in the hospital with broken knee caps or femurs. One comment I read on this article said that the size of the pad the way most goalies like myself have it today is cheating and that is an oblivious comment in my mind. I play U18 AAA and I just got a new set of pads that are definitely big enough (being 36 + 2) for my height, 6’4″. I have a wide enough butterfly that when I go down, theres usually never a hole for the puck to go through me. Still, in a game situation, no matter how long your pads are, the puck will always find a way to find its way through you and/or hit you in a painful spot (the knee). This is why it is a terrible idea to reduce the size of the pads. While reducing the size of the pad, we are critically increasing the risk of injury. Being 6’4″, I already have my concerns of possible knee problems like tearing legiments or muscles (ACL, MCL, Meniscus). Worrying about breaking my knee or even possibly my leg is just another concern to add to the list. 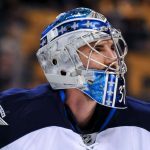 I think we all need to just face the fact that goalies are getting increasingly better every year, and we are all progressing faster and farther than the players. So the NHLPA is saying that we as goalies should be punished for performing on another level than the players themselves? That is just terrible in my mind considering all the innovative technology in sticks and other equipment they have come out with for players. You cant honestly say that the material in a goalie pad has changed AND improved our play (unlike fiberglass sticks and flex patterns on the sticks for players). On that note, how would the NHLPA feel if they were forced to use wooden sticks again? They would be furious and they would throw the thought away at an instant. In the end, I would just rather they start working on ways to enhance the players performance (advancing technology even further) instead of hold us as goalies back from competing to our full potential. Just one thought that immediately comes to my mind is the use of nano technology. Scientists have been working to expand the use of nano technology in our world today. If they made sticks using carbon nano fibers, the sticks would be much lighter and much more durable (stronger). All I ask is that the NHLPA looks at this dilemma from both sides instead of just their side and making it easier for them. They should be looking for ways to improve themselves instead of taking away from the goaltenders. That’s just my take on it.